This fried rice brings back memories from my elementary school days. Since my parents worked a lot, my mom’s aunt (Bà Cô) watched my cousins, sister, and me after school until about 6pm everyday. 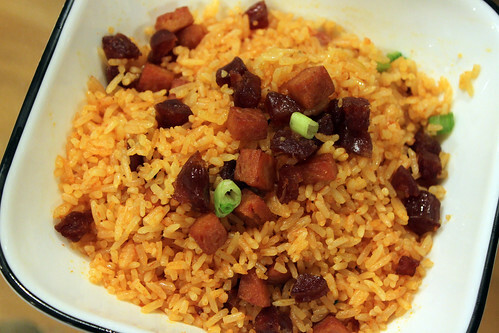 While other kids went home to PB sandwiches and Mac and Cheese, Bà Cô hooked us up with Fried Rice with Chinese Sausage and Spam and…it was red. This was not your typical fried rice. Even today, at every family party, Bà Cô still makes this for us and we still fight over it! The Spam / Chinese sausage combination is awesome. The smoked, sweet flavors of the Chinese Sausage with the salty and yummy mysterious meat we know as Spam. What more can you ask for? 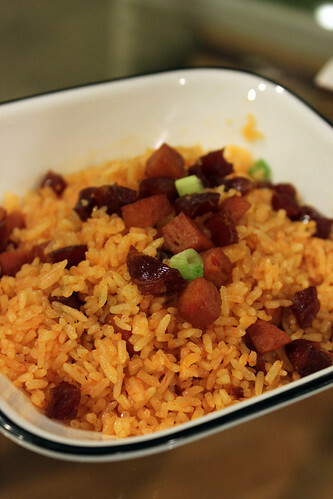 For this recipe, I used Spam and Chinese sausage. I usually add shrimp, but was too lazy to peel and devein the shrimp today. If you don’t like Chinese sausage or Spam, you can substitute with any meat you like. You can also add veggies to it and omit the tomato paste. You can do whatever you like. My mom even makes a version of this fried rice with the crab meat and it is deeee-licious. Put rice in a large bowl. 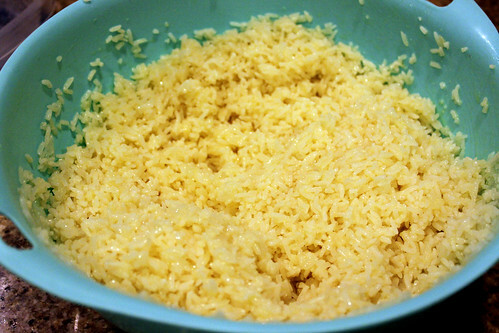 Add eggs, salt, and sugar and use your hands to mix rice and egg until evenly coated. 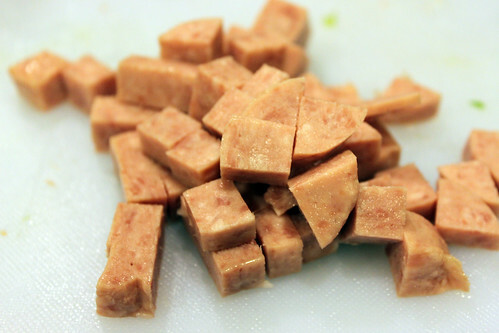 Cut Chinese sausage and Spam into bite-size pieces and set aside. Heat wok to Medium High. Cook Chinese sausage and Spam until cooked thoroughly. Set aside. Add 1-2 tablespoons oil to wok and begin stir frying rice until egg and rice are cooked. You need to stir rapidly and frequently. Add tomato paste and stir until every grain of rice is coated with tomato paste. 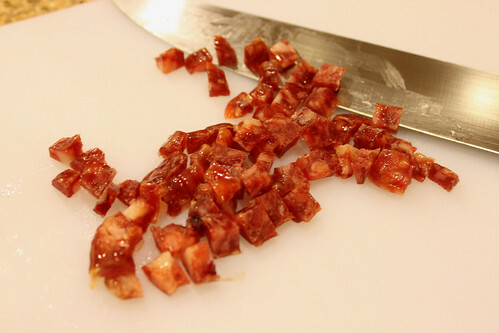 Add Chinese sausage, Spam, and scallions and continue to stir until everything is combined. You can serve immediately or pack away for lunch the next day.